Few weeks ago, I became a blogger. I stated blogging because I was doing an extreme vegan experience over 40 days. To see the daily posts, please copy this link http://nashdoes-a-daniel.blogspot.co.uk/. From then, I have been itchy and looking for excuses to have regular blog. After my vegan experience which finished on 12 April, my first meaty meal was this! Roasted mustard & garlic chicken with fried potatoes & ripe plantains tossed in fresh garlic & parsley. The proportions here are for a meal for six. The chicken weights 2.500 kgs. The chicken of course – 20 cloves of garlic; peeled and cut length ways (each clove cut in 4 at least) – 150 grs of French mustard – 30 cl of Mustard oil – Black pepper – 2 chicken stock cubes & salt (don’t have to use both). *Wash the chicken, remove all the greasy bits around the neck and bum. Remove all the baby feathers, rinse again and lay it on a cutting board. *Crush the chicken stocks and mix it with a bit of salt. Rub the mix on the chicken, then, also rub the mustard all over and inside. *Use the tip of the knife to stab your chicken. In each hole you make insert a piece of garlic. Do this all over the chicken. *Wrap the chicken in kitchen foil and leave to rest for an hour. During that time tidy up the mess and get the accompaniments ready. 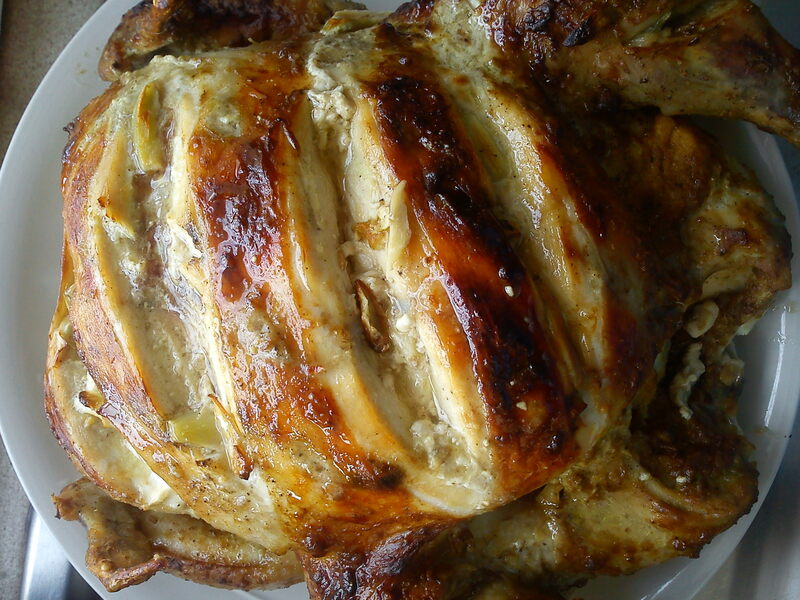 *After the hour, unwrap the chicken and place it on the oven dish. Insert a whole medium onion inside the chicken, drizzle it with mustard oil. *Put it in the oven thermostat 200 ® for 2.5 hours… continuously check your chicken and base it with the juice from the tray as the chicken cooks. 4 ripe yellow plantains; peeled and cut in chunks (like D) – 5 medium potatoes; peeled and cut in exactly the same size as the plantain – 1 medium red onion; again peeled and cut in the same way as the plantain and potatoes – A small bunch of parsley; finely chopped – 3 cloves of garlic finely cut – Half a litre of Sunflower oil for the chip pan. *Mix the plantain, potato and onion together in a container. *Pour the oil in the chip pan and wait for it to hit up. *Fry the plantains, potatoes/onion by portion until golden (it should take 4 to 6 minutes to cook). *When all has been fried, add the chopped garlic, parsley, and toss. That part is ready. Keep it warm in the oven. The thing about mixing potato and plantain is, if you are not looking at what is on the fork, it is always a surprise in the mouth… I just love that. Now time to prepare the sauce. *Get the onion out of the chicken. It should be really soft now after all that cooking. 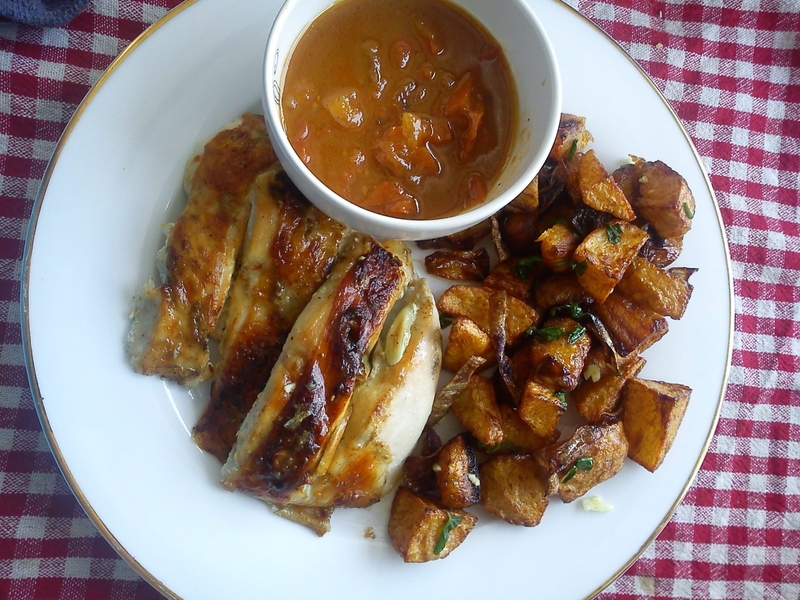 *Pour the juice from the oven tray in a pot and put it on the heat to reduce with the onion from the chicken derriere. *Now, mush the onion and add a tin of chopped tomato. *Leave to cook until ready to your taste. This is obviously a heavy meal. Check your portion and don’t blame me for ya weight! 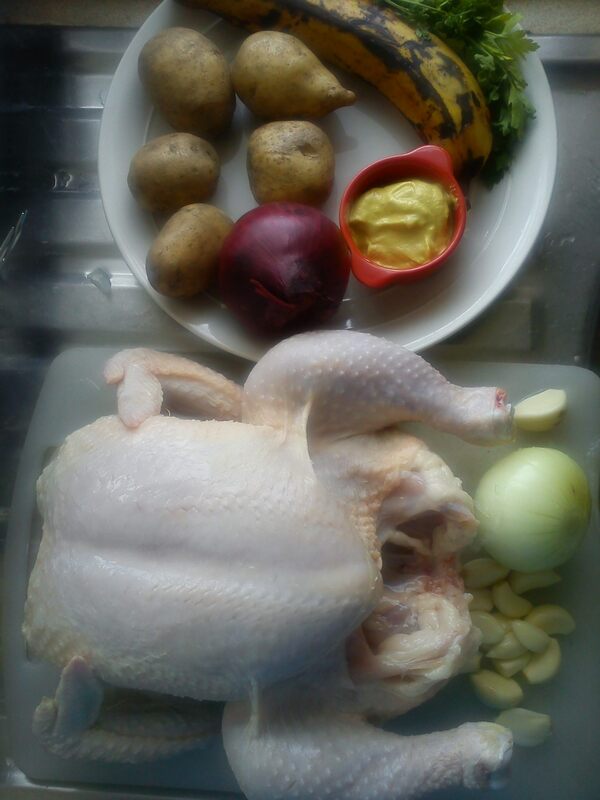 This entry was posted in Main meals and tagged Chicken, French mustard, mustard oil, Onion, parsley, Plantain, Potato. Bookmark the permalink. What’s up to all, how is the whole thing, I think every one is getting more from this web page, and your views are pleasant for new users.